Peach has baked a cake for Mario. When he arrives, it turns out Bowser has kidnapped Peach and stolen the Power Stars. Mario must head into mysterious painting worlds to retrieve the Power Stars if he is to break Bowser's spell. Collect Power Stars to unlock the doors in Peach's Castle and reach new levels. Each stage has six Power Stars to collect. Defeat a boss, win a race, find 8 Red Coins, or just find one that has been hidden. Mario has a huge range of new moves to help him move around in 3D. He can long jump, triple jump, backflip and wall kick. He can stomp, punch, kick, grab, throw and pound enemies. The new Wing, Vanish and Metal Caps temporarily give Mario special abilities. The rabbit you can find in Peach's Castle basement is called MIPS. He is named after MIPS Technologies, a subdivision of the Silicon Graphics company that developed the Nintendo 64 processor. 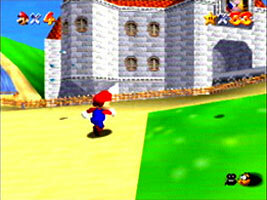 The rabbit was a test model for the Super Mario 64 engine when the game was in early development.